Hey, hey! How was your summer? Did you have a nice time? Did you travel anywhere? Are you ready for fall? Here the temperatures dropped, so I can feel autumn is already knocking on the door. And before we know it December will be here too, so I thought I better start working on my Christmas cards. Here's the latest one I made. I decided to use the cute snowman digi stamp from Whimsy stamps. Colouring was done with pencils and at the end I covered the snowman with Wink of Stella, so in person he's really sparkly, but unfortunately you can't see this in the photos. Papers and embellishments are from my stash. I added layers on top of each other with foam pads, which gave the card some dimension. 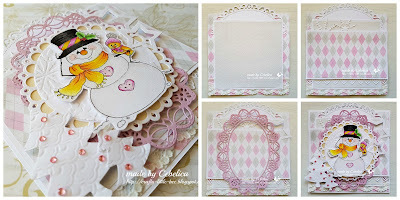 I made this card for the Whimsy stamps DT call and even made step by step photo tutorial for it, because that was one of the requests for applying. So in case you are wondering how I put this card together, check the photo below. I hope this helps. :) If you have any other question just ask! Would be great to have a link to find your video...or names of the dies used. Very cute card! Beautiful creation Cebelica, so pretty. And good luck with the DT call! Love your beautiful card, Cebelica! Your focal image is so adorable and beautifully colored - I love your choice of colors, too. Your layers are awesome! Thank you for playing along with our "Vacation" theme at Words2CraftBy! res prekrasna, vedno občudujem tvoje sloje in krasne šablone ter štampiljke! hvala za tutorial! What fabulous layers...beautifully done!! Thank you for sharing with us at Scrapbook Stamp Society...good luck! Beautiful card! So many pretty layers and what a great unexpected color for a winter card! Thanks for sharing with us at CraftyHazelnut's Patterned Paper challenge! Čudovita. Zelo lep motiv in postavitev. Srečno! Super, da si nam pokazala, da je res videti kot okvir. Lepa novoletna voščilnica. Hvala, da si se nam pridružila v CRAFTalnici. Beautiful!!!! Thanks so much for participating in our CHRISTMAS CARDS ALL YEAR ‘ROUND challenge. Hope you participate in our next challenge!! Have a happy crafty day!!! *If this comment is late I apologize! I’m having major issues lately trying to leave comments due to the stupid ROBOT silliness!! !